Plans by major producers for up to a 50% expansion of world potash production could saturate the market, but a story by Ian Berry on DowJones says "producers in Arizona could be well-positioned because costs will likely be low, giving them an advantage, and the presence of new export supplies out of Arizona could cause headaches for 'a very tight global oligopoly' that controls potash supplies." 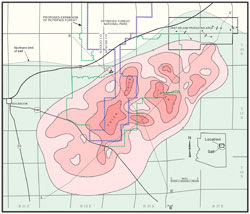 Three companies are currently drilling 74 core holes in the Holbrook basin to characterize the potash resources identified by AZGS. Ian Berry wrote a very good summary. Sandy Bahr, director of the Sierra Club's state chapter, referred to "conservation groups." These are the folks who despise mining. In my opinion, they're better described as preservation groups.